The Federal Open Market Committee, abbreviated as the FOMC, is the monetary policy-making body of the US Federal Reserve Board. Generally, the Committee meets eight times a year (roughly once in six weeks) to review the economic situation of the US. To maintain economic stability, the Committee makes variations in its target benchmark interest rates. At the end of the policy meeting, the FOMC also issues a statement summarizing the economic outlook and policy decision. Four times a year, at the end of the FOMC meeting, the Fed Chair (currently Janet Yellen) conducts a press meet and provides more details about the course of the economy and the reasons behind the interest rate decisions. Since major financial institutions use these indicative rates for overnight lending, a cut or hike in the interest rates has a phenomenal effect on the liquidity and currency exchange rates. Furthermore, a rate hike increases the attractiveness of a currency as investors who are looking for better yield would be drawn towards it, as long as the country has a decent credit rating. To sum it up, a decision to hike or slash rates affects all the financial markets (currency, equity, and bond markets). Thus, a precise understanding of the FOMC decision and its probable impact on the market would enable a binary trader to generate handsome gains in a short span of time. Before deciding on how to trade binary options on the basis of an FOMC decision, it would be better for a binary trader to have a clear idea of the possible decisions that can be taken by the Committee. When the economy is not growing as expected, the Committee may feel that the situation is not conducive for a rate hike. Furthermore, the FOMC would prefer to monitor the economic situation for some more time before making a final decision. In such a case, the benchmark interest rates would be left unchanged. The majority of the twelve voting members may turn hawkish and support a rate hike considering the rise in inflation, lower jobless claims, increase in wages, and a rise in business and consumer confidence. The members of the Committee may believe that the economy is not performing as per expectations. In such circumstances, to create inflationary pressure, FOMC may take a dovish stance and resort to rate cut. Ultimately, lower interest rates increase liquidity and boost spending, thereby resulting in the expansion of the economy. The main objective of the FOMC is to maintain economic stability. The interest rate decisions will be based on that. However, the decision taken by the FOMC may or may not match the expectations of the market. That is when the market turns volatile. Major financial media and investment research firms regularly conduct surveys among market participants, economists and analysts to gauge the overall expectation of the market. The survey results are also published regularly by financial publications such as Reuters, Bloomberg, and Financial Times. This enables binary traders to be well aware of market’s interest rate expectation. While discussing about market expectations, we had mentioned about the surveys conducted by the financial media and investment research firms. No doubt, they are one of the most important sources of information to look at. The FedWatch Tool offered by the CME Group is a must watch chart for binary traders. 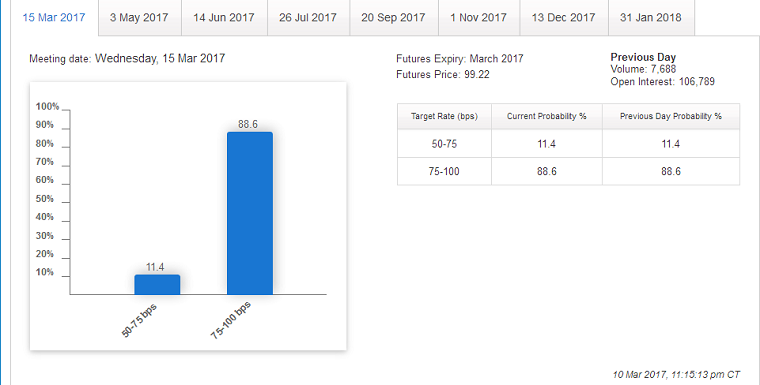 The tool on the basis of 30-day Fed Fund Future Prices shows the probability of a rate hike in the upcoming FOMC meetings, as shown below. Additionally, a binary trader should regularly watch the Commitment of Traders report (30-day Federal Funds — Futures only). Any increase in the net long position is a sign of optimism among traders regarding a rate hike and vice versa. The COT chart provided below shows a steep rise in net short positions since August 2016. Between August and December, the market added short positions with a December hike in sight. 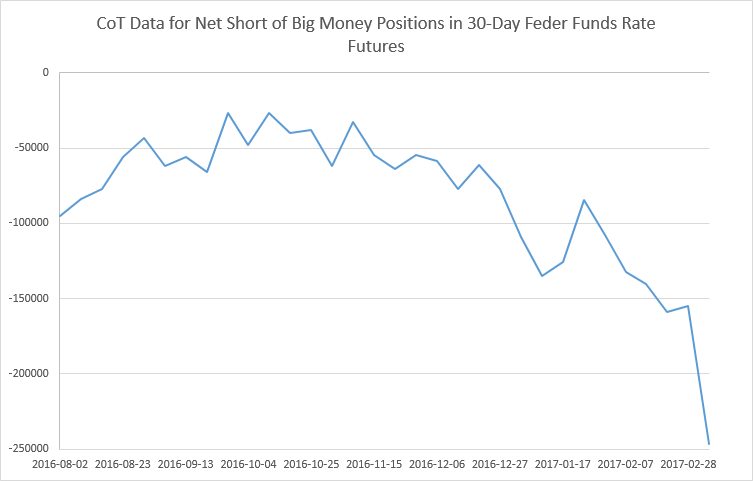 Again, when the expectations of a rate hike in March increased, following Janet Yellen’s hawkish statement before the Senate Banking Committee, the net short positions increased significantly. It is important to remember that the futures are traded as the ‘cost of funds’, so the short positions reflect higher interest rate expectations. Another important chart to monitor is the US Dollar Index (USDX, DXY) traded in the Intercontinental Exchange (ICE). The US Dollar Index would climb whenever there is an increase in rate hike expectations, as shown below. If the possibility of a rate cut increases, then the US Dollar Index would decline. 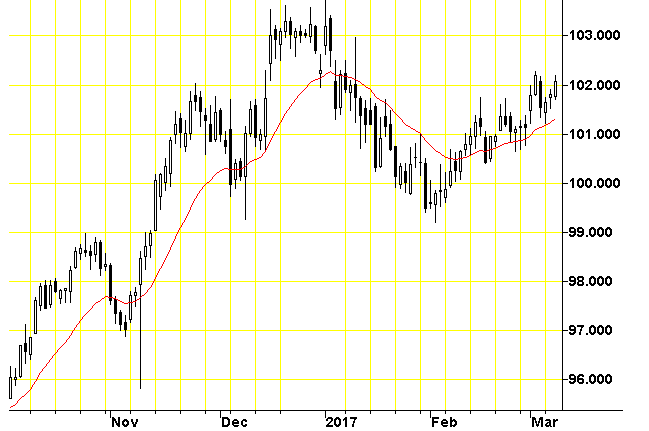 The COT chart and US Dollar Index provide vital clues about the market’s expectations. In this case, the US dollar is expected to remain range bound against its rivals. So, the following option contracts can be purchased whenever a US dollar based pair is trading near the technical support levels. A call option contract with short-term expiry ranging from a few hours to a week. A one touch call option contract which expires in a week. The above trade would be profitable only when the economic outlook does not provide any hint about a future rate cut. If the economic outlook warns of a possible rate cut, then a put option contract can be bought whenever a US dollar based currency pair trades near a technical resistance. An unexpected rate hike would trigger a strong rally in the greenback. Thus, entries should be made as explained, without delays. A call option or one touch call option contract with an expiry period ranging from a few minutes to several weeks can be purchased. The reason is that unexpected rate hikes create a fundamental shift in the market. A ladder option with multiple target levels on the upside can be purchased to gain from the strong rally. Any indication of future rate hikes in the economic outlook would heighten the probability of success in the trade. Ideally, a binary trader should purchase a put option or one touch put option without any delay as the greenback would plunge against major currencies immediately. A ladder option with multiple target levels on the downside can be purchased to gain from the steep decline in the exchange rate of the US dollar. Any indication of future rate cuts in the economic outlook would increase the probability of success in the trade. The market would have considerably priced in a rate hike. So, if the FOMC announces a rate hike above expectations, there would be certainly a rally in the US dollar based pairs, but not to the extent of what would be seen in the case of an unexpected rate hike. Thus, a binary trader should be cautious while opening a position. A call option can be bought when a US dollar based currency pair trades near a major support level. Care should be taken to select a short-term expiry period ranging from a few hours to a day or two. Since the momentum will not be too strong, there will be zigzag movements. Thus, medium and long-term expiry periods should be avoided. Again, in this case, the market would have considerably priced in a rate cut. So, if the FOMC announces a rate cut deeper than expectations, then the downtrend in the US dollar based pairs will not be very intense. In such circumstances, a trade can be opened as follows. A put option can be bought when a US dollar based currency pair trades near a major resistance level. Care should be taken to select a short-term expiry period ranging from a few hours to a day or two. Since the momentum would be weak, there will be zigzag movements. Thus, medium and long-term expiry periods should be avoided. Before a final decision is taken, a trader should wait for the statement on the economic outlook and look for hints regarding future rate hikes or cuts. Even if the interest rate decision of the FOMC is in line with the market’s expectation, still, any hint about a future rate hike would spur another round of rally in the US dollar as the market would start pricing it in. Likewise, a hint about a future rate cut would trigger another round of selling in the greenback. After gaining some experience in trading the US dollar based currency pairs, a binary trader can attempt to trade currency crosses based on their correlation with the greenback.